Our water heaters are one of the most important plumbing systems in our homes. They give us access to water that we need to bathe, cook, clean, and wash with, making our daily lives a whole lot easier. 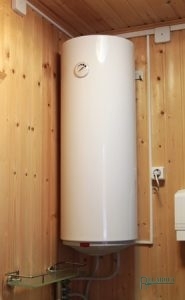 One of the most common water heaters on the market is an electric water heater. It is a very energy efficient water heater because the heating element is in the water, so the system doesn’t have to work too hard to heat up our water. If you have an electric water heater and have noticed that you aren’t getting adequate warm water or there are leaks at the base of the tank, call the professional plumbers at All About Plumbing & Septic. For Electric Water Heater Repair, Call All About Plumbing & Septic! At All About Plumbing & Septic we are able to provide homeowners and business owners with electric water heater repair in Mills River, Hendersonville, and Asheville, NC. Our plumbing contractors are able to inspect your water heater and provide it with the water heater repairs that it needs. If for some reason the electric water heater is beyond repair, we will be able to offer water heater replacement service. To make an appointment with our plumbing company today, call us at 828-778-2425 to get a hold of a plumber. In order to avoid getting a whole electric water heater replacement, it is important that homeowners and business owners know when electric water heater repair is needed. Knowing what signs to look out for can help you prevent shelling out thousands of dollars for a replacement. Below are some of the signs that you need repairs for your electric water heater. No Hot Water: If you turn on the tap for hot water and hot water doesn’t pour out, even after minutes of it being on, you will need to call someone for repairs. Irregular Water Heating: If you have the tap turned on hot but the water is cold, or you have the cold tap turned on and it’s coming out hot, then you should have your water heater looked at. Metallic Taste: This could be due to the fact that you need water filtration, but if you are just now experiencing water that tastes metallic-y, contact someone to look at your water heater. Rust Colored Water: This is in the same vein of the metallic tasting water; rust colored water is not normal and it must be addressed at the very first sign. Tank Leaks: If you notice that your electric water heater tank is leaking, that is something that needs to be fixed ASAP. Strange Noises: Your electric water heater shouldn’t be making any banging or cracking noises–if you hear any strange sounds coming from the water heater, that isn’t normal and needs to be looked at. Do any of these sound familiar? If so, call our team of experts for high-quality electric water heater repair in Mills River, Hendersonville, and Asheville, NC. 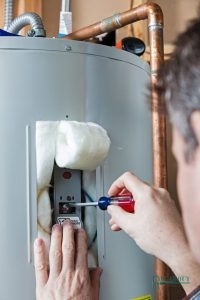 We will give your electric water heater and thorough inspection and find the cause right away. Some of the most common reasons that water heater is having issues are the electrical breaker, heating element, valve, tank, or the thermostat. We will be sure to remedy the issue no matter what the problem is. Are you in the market for a new water heater? If you have a gas water heater but you are looking for something different, you can’t go wrong with an electric water heater. This type of water heater is actually more energy-efficient than gas because the heating element sits right in the water, making it easier for the water heater to heat up water. Not only that, the tank is insulated, so when it fills with water, it can stay warm. If you are interested in an electric water heater for your home or business, you can count on our plumbers for expert water heater installation service. We Can Also Offer Electric Water Heater Installation Service! Our plumbing contractors are able to install 10-gallon to 50-gallon tanks, so whatever size you need for your home or business, we are able to install it. We also install some of the most reputable electric water heater brands, so you can be sure that when you call us for electric water heater installation, we will set you up with one of the best in the industry. To get more information, call us at 828-778-2425. If you already have an electric water heater, we can also offer electric water heater repair in Mills River, Hendersonville, and Asheville, NC. The biggest perk of an electric water heater is that they are energy-efficient. With a gas water heater, you have to continually keep the pilot light on in order for it to run, but since the heating element is in the water, it doesn’t take a lot for it to heat up water. While this is a big advantage to an electric water heater, there are other benefits to investing in this type of water heater for your home or business. The cost of an electric water heater is going to be a lot less than a gas water heater. These water heaters are safer because there is no risk of a gas leak or carbon monoxide exposure. You will have better indoor air quality because when gas water heaters are installed in small spaces, there is a chance of combustion products that will be released. They are able to last 10 to 15 years. Electric water heaters are easy to use. They aren’t going to break down as often as other types of water heaters. Whether you want an electric water heater or you want electric water heater repair in Mills River, Hendersonville, and Asheville, NC, All About Plumbing & Septic is ready to help you. Our plumbers provide comprehensive inspections to determine what is wrong with your electric water heater, and we inspect your home or business to determine what size electric water heater you need. For more information about our services, get in touch with us by dialing 828-778-2425. Updated on January 18, 2019 at 12:33 pm by All About Plumbing.